Liz feels she and Lucky could be happy again, but he feels she’s just seeing what she wants to see and there’s no going back. Liz accuses him of ignoring the good. Liz wants to move forward with the lessons they’ve learned. Liz says Aiden is their new start, he’s a gift and they need to stop punishing themselves and have happiness. Lucky says he can’t do it anymore, he’s accepted it and she needs to as well. Liz accuses him of wanting it both ways, being a father and then flitting out of their lives when he feels like it, leaving her to hold down the fort. Liz says Ethan told her Lucky still loved her and that’s why he’s running. Lucky admits he does love her. Liz says they need each other, but he says their too co-dependent on each other. Lucky says first love doesn’t last. Liz says they’ve done some growing up the last few years. Lucky says love isn’t enough. She needs time and help. Liz is shocked that Lucky thinks she needs help. She says she wants the father of her children to commit to the kids and to her. Lucky claims it’s not about commitment, he’ll always be there for them. Liz says, like his father was there for him. Lucky says he’s been a hands on father, he’ll take the boys until she’s stronger. Liz says he has the boys in his life when it’s convenient, but his journey always comes first. It’s not fair. She accuses him of letting his dead wife of coming before his kids. Lucky says they needed a break to find out who they are. Liz says she’s a single mother begging everyone around her for help with her kids, so she can work to provide for them, just like Laura. Lucky says he isn’t like his father. Liz says Luke’s pretending to be sober, so he can get a free pass for running over her son. Lucky starts to leave, saying she’s getting upset. Liz yells at him to walk away, since he’s so good at it. When he’s gone, she pulls a lipstick out of her bag. When he returns with a nurse, Liz is gone and there’s a message on the pillow, “can’t do this”. Jason finds Sam in the alley looking at Franco’s tag. He wonders why she came back, since that’s what Franco wants. Jason wants to figure out Franco’s next move, but Sam doesn’t want him to obsess. She wants him to stop blaming himself. Sam wants to be normal and heads over to Jake’s. Shawn moves into Carly’s house and wants to set some ground rules and have her follow his orders, something Carly’s not planning on doing. He wants her to use common sense. Michael arrives and is angry at Shawn’s behavior towards his mother. Carly explains that Shawn’s moving in to protect them from Franco and explains about the latest gift. Carly assures him that they are taking precautions, which is why Shawn is moving in. Michael feels Shawn is taking advantage of the situation. Carly tells him he should thank Shawn for saving Josslyn and to show respect to him, like she does to Abby. Michael wants to go after the guy who’s assaulting the dancers. Shawn warns him that it will put him in Franco’s sights and to leave it alone. Diane and Mayor Floyd meet up at Jake’s. Turns out Floyd is no longer the mayor, but has bought the local paper Diane is writing a column for. Sam comes in to talk to the girls, asking if they remember any more about the attacks and vowing to stop whoever is doing it. Floyd seems to be distracted, either by the dance girls or by Sam. Michael comes in, demanding more information from the girls, until Sam pulls him away and explains that he can’t yell at the girls. Michael makes a comment about the girls being attacked because they’re strippers, which sets off Sam, who says no one should be victimized. Michael wonders why she’s so upset, but she says she didn’t like the way he spoke to the girls. Michael admits he’s mad that Shawn is moving in with Carly and then talks about being Franco’s victim. Sam angrily throws a pool cue. Sonny lets himself into his old house. A beat cop shows up, thinking he’s breaking in, but Sonny says he’s the owner. The cop tells him to bulldoze the place and explains about the family that used to live there and how the kid, Sonny, used to beat his mother. Sonny angrily explains who he is. The cop threatens to arrest him. Sonny says he’ll charge him for false arrest and orders him to leave. 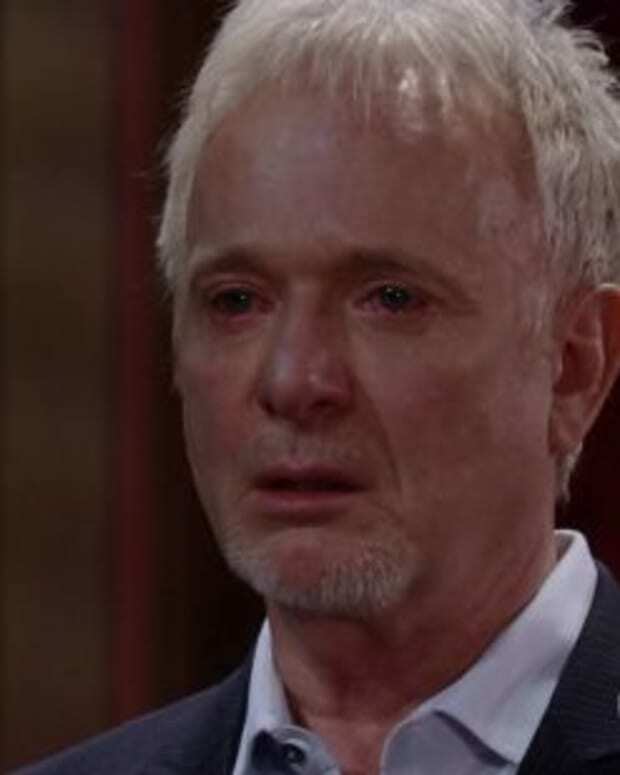 Sonny yells at “Deke” and then sees himself as a child, crying in the closet. Carly explains to Shawn what happened to Michael in prison, but makes him promise not to let on to Michael that he knows. Shawn offers to upgrade the security system. Jason shows up and Carly explains that Michael left, angry and that she’s worried about him. Shawn asks her to respect each other things, but then complains that her shoes are lying around. Carly says her house her way. Later on, she watches while he does pushups. Coleman shows Jason a new Franco tag, in the alley behind Jake’s.